Q: What is IN FORCE911? 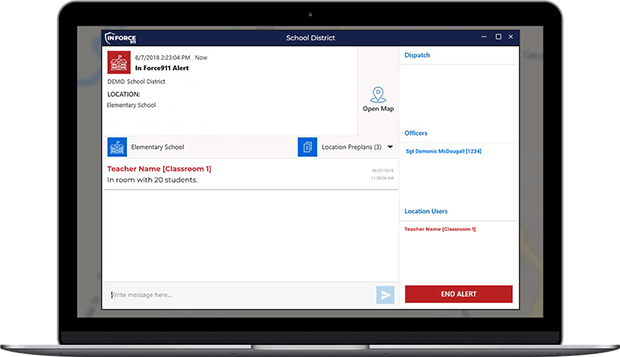 A: IN FORCE911 is a real-time threat alert and notification software, connecting those experiencing a threat – like a school building – to local law enforcement in seconds instead of minutes. Q: What was the purpose in founding the company? A: First and foremost, I’m a father of four children and school safety is something that is incredibly important to me. Based on decades of experience in working with law enforcement, we recognized a tremendous need to enhance the way responding officers approach a building under threat, in this case, an active shooter situation – while working to make schools as safe as possible. Q: What is the specific mission of the company? A: The mission of our company is to simply saves lives. By reducing police response time and increasing communications, we recognize the difference we can make by mitigating the outcome of the situation. Q: What does your technology do? 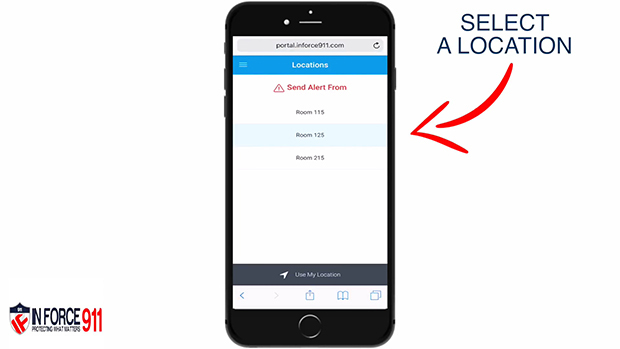 A: Our software enables a teacher experiencing a threat, to send an alert to local law enforcement in 12 seconds or less which contains specific information, down to the classroom number, while opening a two-way chat portal. Q: Who is your primary targeted end-user? A: We work with local, county and state law enforcement agencies and, public and private schools. Often times, we also deploy our software with municipal buildings and colleges/universities. Q: How many customers are you working with and in how many states? A: We have a very high concentration of users throughout New England, including Maine, New Hampshire and of course Massachusetts. Additionally, we have a strong presence in the mid-atlantic region, including Virginia. Q: Who is your single largest customer? A: Our largest school district is the city of Worcester, MA. We also work with New Hampshire State Police – a state-wide agency. Q: What do experts say is the best way to save lives during an active shooting? A: According to a joint study conducted by the FBI and Secret Service, they concluded that the reduction in police response time is the only true mitigating factor. Often times, we understand that law enforcement operate under the “first on, first in” mentality. Recognizing this, we want to help get police inside the building as quickly and safely as possible. Q: How does your software reduce police response time? A: IN FORCE911 sends an alert to the police cars, directly including the local/regional dispatch center. In essence, we are going directly to the source as opposed to a conteralized E911 center. Of course, our alert is sent to the officers in 12 seconds or less, as opposed to what can be a 2-4 minute window by the time local law enforcement receives the threat. Q: How could you have positively impacted Parkland, FL? A: We would hope that our technology would have alerted Broward County law enforcement in a much faster manner. 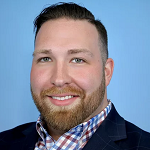 Recognizing that seconds matter most, even if IN FORCE911 reduced police response time by seconds, we could have positively impacted the situation and save a life. That’s why our software exists – that’s who we are. Q: Does your software work with other programs? A: IN FORCE911 works perfectly with options-based response trainings like the government sponsored RUN, HIDE, FIGHT. Essentially, IF911 provides staff members with the knowledge of what’s happening and where. Therefore, we help them take action in their best interest, based on the threat. Q: Do you believe you provide peace of mind to parents? A: Given the inherent uniqueness of our software and the ability to mitigate a potentially life-threatening situation, we believe that we are making a difference. Q: What is the greatest challenge in school safety? A: In certain situations, school staff members may not have access to their hard-wired classroom phones or intercoms to alert others in the building of active emergencies or threats. This creates a communication barrier which we know can be potentially lethal in certain emergencies. Q: How do you help law enforcement better perform their duties? A: By giving them the tools to all the information they need to know about a building under threat and it’s emergency in real-time. They are provided the floor plans, ariel pictures, emergency plans as well as all the entrances and exits of the building, which gives them the power to make the best and safest approach. Q: Are you also increasing officer safety? A: Yes, by knowing what’s going on in the building based on our two-way chat capabilities, our officers can know where in the building the threat is so they can best approach it and help to evacuate other parts of the building where the threat may not be. Knowledge saves time and time saves lives in these situations.